Florida is legendary for golf and its top resorts. With highly rated course designers including Greg Norman, Rees Jones, Arnold Palmer, and Jack Nicklaus you know the championship golf in Florida is truly world class. With golf resorts including luxury leaders like the Ritz-Carlton, The Breakers, JW Marriott, Disney, and the Hyatt, it’s evident that that you may not find a better combination for an amazing golf vacation anywhere in the world. Florida takes its golf seriously, and so should you. 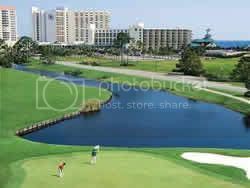 Whether you are a weekend golfer a pro on the PGA tour we have the ideal location for a Florida golf vacation. 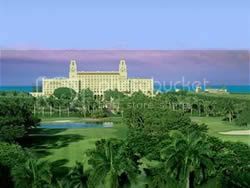 The best top 10 golf resorts in Florida are listed below. Try one or try them all, this list only includes the best of the best and we are sure you will not be disappointed. Don’t forget to pack your clubs! Experience the breathtaking beauty at one of the the top rated golf resorts in Florida at the Ritz-Carlton Naples. With a vast portfolio of top awards including the title of #1 golf resort in Florida by Conde Nast Traveler magazine readers, visiting the Ritz-Carlton Naples insures a fantastic golf vacation. The resort itself is home to two championship golf courses including the Tiburon designed by the legendary Greg Norman. 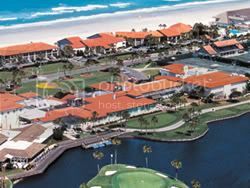 Tiburon also host the PGA Tour and the Shark Shootout. The courses are marked by stacked sod wall bunkers, coquina sand and no rough. This is a top Florida Golf Resort you have to experience for yourself. An American Classic, The Breakers Palm Beach is the destination choice for avid golfers, as well as leisure enthusiast who enjoy the game. Featuring two golf courses that are exclusive to resort guests and club members. On-site at the resort there is a par 70 Ocean Course, Florida's first 18-hole course and ten miles away is the The Breakers Rees Jones Course, offering one of the premier golf experiences in the Southeast. Looking to improve your game, consider visiting the John Webster Golf Academy offering world class instruction. After a round be sure to relax at the new Ocean Golf & Tennis Clubhouse, reminiscent of a grand Florida Estate. This top Florida Golf Resort features a par 72 Greg Norman Signature Course that has unrepresented personal attention to detail. Positioned in the Heawaters of the Everglades and surrounded by live oaks, palmettos, and magnificent pines the JW Marriott offers access to a magnificent golf course enhanced by the rare natural elements. The resort itself features sweeping vistas and enticing environment packaged in Spanish Colonial architecture. Plan the ultimate Florida golf vacation at the JW Marriott Orlando and be ready for the round of your life. The wife won't mind, she'll be relaxing in one of the area's top spas via the provided access to the Ritz-Carlton. This Top Florida Golf Resort features the first and only co-designed course by Arnold Palmer and Jack Nicklaus. This amazing collaboration consists of a coquina-edged layout of impeccable beauty and incomparable course play with each hole containing characteristics of each hall of famer. 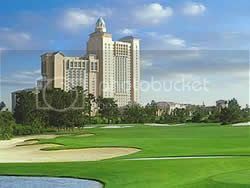 The World Golf Village Renaissance is located in close proximity to the World Golf Hall of Fame making this the ultimate golf resort. Be sure to pay close attention to hole number 15, it was one of the "Dream 18" in the Sports Illustrated Preview to the 2006 Ryder Cup. Congratulations, you have found the ultimate Florida golf experience and it's never been so close. 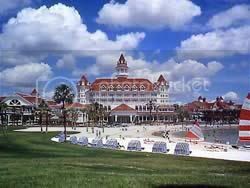 The Grand Floridian is the Victorian-style crown jewel of the resort hotels at Walt Disney World and is a top Florida Golf Resort. This famous family oriented location gives golfers preferred access and proximity to 5 championship golf courses, true amusement for adults! Although there is a fantastic family oriented 9 hole course virtually on-site, the real thrill is the Osprey Ridge Golf Course, just minutes away. This 18-hole Tom Fazio designed course is one of four championship courses offered by Disney. With a Gold Medal rating three times by Golf Magazine, you know golf here is a little more serious than the cartoon mouse and his pals. Offering both on-site golf and beach access, the Ritz-Carlton Amelia Island is a top Florida resort that is an unforgettable escape. 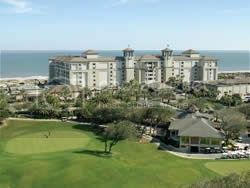 The Golf Club of Amelia Island is a private club catering to the surrounding exclusive community of Summer Beach. 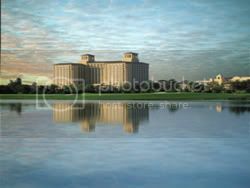 This golfer's dream was desiggned by Mark McCumber and Gene Littler and is as beautiful as it is challenging. Guest of the Ritz-Carlton Amelia Island also get access to The Golf Club of North Hampton, one of the areas newest courses and designed by Arnold Palmer. Crafted from one of Florida's most dramtic landscapes, the course offers natural terrain with sand dunes and rolling elevations. This location is also a Top Florida Beach Resort. 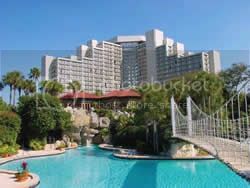 An inviting AAA Four Diamond Luxury Resort Hotel in Orlando, the Hyatt Regency Grand Cyrpress is one to consider for your next Florida Golf Vacation. The Hyatt features an array of on-site amenities including 45 holes of Jack Nicklaus Signature Design golf. The Grand Cypress Academy of Golf is also on-site and features nationally acclaimed instructors and is ranked among the Top 25 Golf Schools in the US. Pair the outstanding golf at this top Florida Family resort with tennis, sailing, swimming, and fine dining, they Hyatt Regency Grand Cypress offers luxury the way it is meant to be experienced no matter how you envision your vacation. In Ponte Vedra Beach Golf has always been a way of life. In fact the Ponte Vedra Inn and Club introduced the first course to the region in 1928 and today is considered the golf capital of the east coast. This top Florida resort encompasses golf greatness at all levels. As a guest of the Inn you get access to two courses, the Ocean Course and the Lagoon Course, both offering a distinct take on this prestigious game. Get a chance to use every club in your bag with meandering lagoons, elevated Bermuda greens, undulating fairways, and a prevailing sea breeze. Did we mention the Ponte Vedra Inn and Club is also a top 10 Florida beach resort? So bring the family and enjoy the best of both worlds. 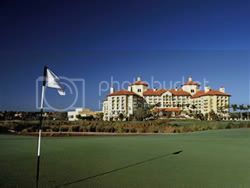 A sister property to the JW Marriott Grande Lakes, both of these locations are considered Top Florida Golf Resorts and share the same championship course. It easy to see that if there are two locations in the top 10 golf resorts for the state, the course itself must be top notch. The par-72 Greg Norman Signature course is one of the highest rated course in the area and everyone knows the resort itself is a leader in luxury accommodations. Not only can avid golfers enjoy the distinguished course, children and young adults under the age of 17 play free with a paid adult round. Plan your vacation to the Ritz Orlando Lakes and enjoy a luxury experience like no other. 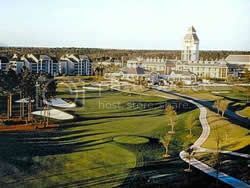 This Sandestin Hilton is and up and coming Top Florida Golf Resort and compared to the other resorts listed is considerably more affordable. One of the only resorts in Florida wedged between the bay and the beach this resort is home to four championship golf courses. The cool gulf and bay breezes make the heat of the summer all so much better while improving your golf game. The water views assist in making your golf vacation truly memorable. The hotel itself is perched right on the sugar white sands that make Northwest Florida one of the top destinations in the south. Fresh off a nearly $7 million dollar remodel, the Sandestin Hilton is by far the best value for your money when booking a top golf resort.